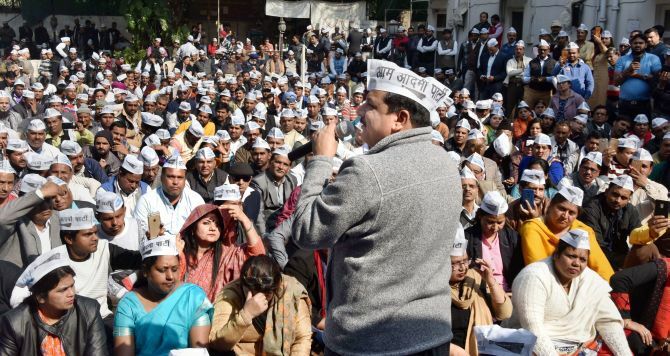 The Delhi high court on Wednesday refused to stay the Centre's notification disqualifying 20 Aam Aadmi Party MLAs for holding office of profit, but restrained the Election Commission from taking any 'precipitate measures' like announcing dates for bypolls till January 29. Justice Vibhu Bakhru sought the response of the poll panel and the Centre on the AAP legislators' pleas challenging their disqualification for holding office of profit. The high court summoned the entire records pertaining to the proceedings leading to the recommendation of the EC for 20 MLAs' disqualification which received the President's assent on January 20. The court said the matter required consideration, and hence it would hear it on a day-to-day basis from January 29 onwards. It said the court will extend its direction restraining the EC from taking any 'precipitate measures' if required. "The EC should produce the record on or before the next date of hearing on January 29. Till next date of hearing, it will restrain itself from taking any precipitate measures like announcing by-election dates on the seats in question," the judge said. The court's interim directions came after senior advocate K V Vishwanathan, appearing for five of the 20 AAP MLAs, said in case the court does not stay the Centre's notification, it should at least ask the EC to withhold the by-elections. The counsel submitted that if the poll panel is not restrained, their whole purpose will be defeated. He also sought that the disqualified legislators be allowed to function as MLAs till a final order is passed on their pleas. To this, advocate Amit Sharma, appearing for EC, said he did not see any reason to disturb the present position till the next date of hearing. "Nothing to happen between now and the next date of hearing," the bench noted then. The EC counsel also opposed the Delhi government being arrayed as a party to the MLAs' petition saying it had filed an impleadment application before the poll panel which was dismissed. He said the Delhi government has not challenged the EC's order till date and hence the state has no locus to be added as a party here. He also said that this matter should be heard by the division bench. To this, the bench said it will look into this aspect at a later stage. The petitions were filed by eight AAP MLAs challenging the Centre's notification, disqualifying 20 of them for holding office of profit. Earlier in the day, the court had said it will hear the plea in the afternoon as it was unable to conduct hearing in other matters due to the crowd in the courtroom. The court was jampacked with eight AAP MLAs, their supporters, counsel and some senior members of the party, besides scribes. On January 19, the poll panel had made the recommendation for the disqualification of the 20 legislators, which was given assent by the President. The EC had made the recommendation while deciding a plea by advocate Prashant Patel, seeking disqualification of 21 AAP MLAs for holding the office of parliamentary secretaries, which he had said amounted to office of profit. Proceedings against Jarnail Singh were dropped after he resigned as the Rajouri Garden MLA to contest the Punjab assembly polls. On January 20, the Ministry of Law and Justice issued a notification that the President had held that the 20 MLAs stand disqualified under Section 15(1)(a) of the Government of National Capital Territory of Delhi Act. The MLAs, whose appointment to the post of Parliamentary Secretaries between March 13, 2015 and September 8, 2016 was held as office of profit, contended that the entire episode leading to their disqualification was a clear manifestation of the process in which they were denied the principle of natural justice of being heard. Advocate Manish Vashisht, appearing for five MLAs, said 'the findings of the EC are contrary to Article 14 (equality before the law) of the Constitution, ultra vires, void ab initio and an attack on the basic fabric of democracy'. On January 22, the MLAs had withdrawn from the high court their earlier applications as they became infructuous on account of President giving his assent to the EC's recommendation to disqualify them. They said the decision by the President as well as the EC were taken in 'undue haste'. The plea by the MLAs sought quashing and setting aside of the January 19 opinion of the EC and the Centre's January 20 notification stating the President had held that the 20 MLAs stand disqualified under the GNCTD Act. The 20 MLAs include Adarsh Shastri (Dwarka), Alka Lamba (Chandni Chowk), Anil Bajpai (Gandhi Nagar), Avtar Singh (Kalkaji), Kailash Gahlot (Najafgarh) -- who is also a minister -- Madan Lal (Kasturba Nagar), Manoj Kumar (Kondli), Naresh Yadav (Mehrauli), Nitin Tyagi (Laxmi Nagar), Praveen Kumar (Jangpura). The others are Rajesh Gupta (Wazirpur), Rajesh Rishi (Janakpuri), Sanjeev Jha (Burari), Sarita Singh (Rohtas Nagar), Som Dutt (Sadar Bazar), Sharad Kumar (Narela), Shiv Charan Goel (Moti Nagar), Sukhbir Singh (Mundka), Vijendar Garg (Rajinder Nagar) and Jarnail Singh (Tilak Nagar).